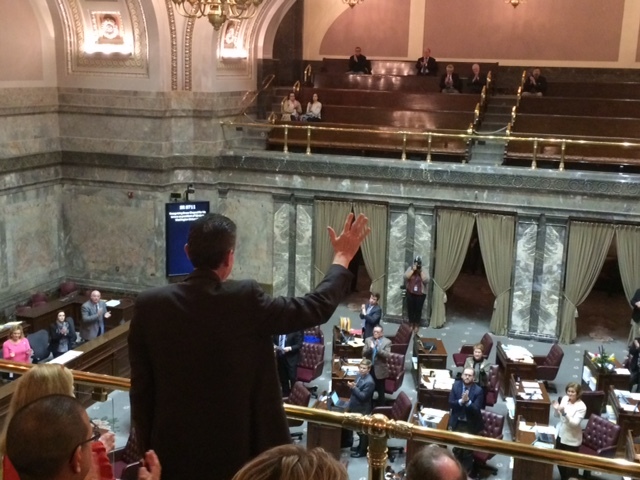 Today the Legislature formally recognized the public service of WWU President Bruce Shepard and his wife Cyndie Shepard for their contributions to improving higher education in Washington State. Highlighting their work at Western Washington University, the Senate Resolutions for Bruce Shepard and for Cyndie Shepard were approved today, and similar resolutions for Bruce Shepard and for Cyndie Shepard were approved earlier this month by the state House. Local legislators from both chambers were among those sponsoring the resolutions. Bruce Shepard is retiring from Western in June, after serving four decades as an educator and academic leader, including serving eight years as the WWU’s president. Under President Shepard’s leadership, Western has been recognized as a regional and national leader for academic success and community engagement, has increased STEM degree production by fifty percent, and has developed an identity of a publicly-purposed university that builds a stronger Washington State by serving traditionally underserved students and preparing graduates to join the workforce. Cyndie Shepard is also retiring from Western in June, after serving as Western’s first lady and Executive Director of Western’s Compass 2 Campus program, a nationally-recognized, award winning mentoring initiative that places Western students in local school districts to encourage students to graduate from high school and pursue higher education. The Compass 2 Campus program has had great success in Whatcom and Skagit counties and positively impacts the lives of WWU student-mentors and K-12 students alike.